The MG Maestro EFi and later badged 2.0i was the car the MG Maestro should have been when the model was launched in 1983. As it was it was not announced until October 1984, but at a stroke took the car from a trailing also ran into a position of class leader and one which turned the establishment on its head. The leader at the time was the iconic Golf GTi and in all dynamic aspects the 2 litre electronically injected, digital ignition O series engine was in front. Only build quality and a dismal reputation held the model back and this did have a quite significant effect, even though the Motor and Autocar road tests said how good the car was and how much of an improvement it was over the original R engined 1600, which generated the negative view for the model. Unfortunately the damage done was deep and the MG Maestro EFi was never to enjoy the sales success it deserved. As most of the problems with the 1600 models was with the R series engine and how it performed, or didn’t, the change to this beautifully sweet and well controlled 2.0 litre O series engine that had class leading torque and superb manners in all driving conditions was a stunning change. Not only was the way the car drove so much better, but it went so much better and was also remarkable economical with it. Married to the engine was an end on Honda PG1 series gearbox with the traditional Honda sweet engineering that made using this gearbox so sweet and easy. Internal ratios were well spaced and so here was a Powertrain that was class. How good that gearbox was and is, can be seen from the fact that not only did the gearbox become the standard mainstream gearbox for above 1600cc Rover cars, but it was used in almost all post 1995 MGs and survived the collapse of MG Rover in 2005 to be resurrected into volume production in China for the new range of MG cars being built there and in the UK. The EFi also saw suspension and braking changes to match the increased performance and power steering became an option too. Outside though the changes were small with the body extensions being carried over from the 1600 models, but with a new style body coloured grille. 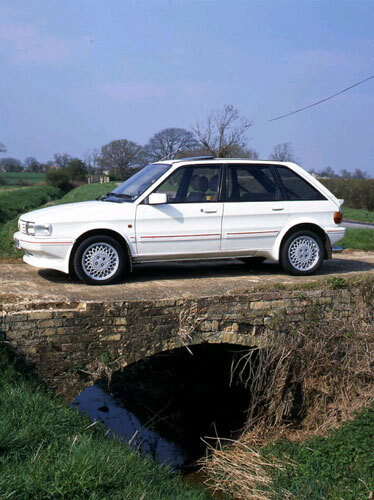 Some cosmetic changes including colour coding the body extensions together with different and larger 15” diameter alloy wheels appeared in 1989, but otherwise there was little change to the range before it was quietly dropped in 1991. The MG Maestro is a model that is labelled as a badge engineered car and in 1600cc form it can be justified since the differences are largely small cosmetic otherwise simple bolt on’s. However, the 2 litre models were unique in that there were only the MG versions that used a 2 litre engine with different gearbox, brakes and suspension, which rather hides how good the MG Maestro was and even today a good one remains a very practical car, and one that in its early years pioneered a number of leading edge features that have since become commonplace.